Case IH has launched its new range of balers, including round, large square and small square balers suitable for baling a variety of crops from straw through to silage. There are two RB round baler models available: the Rotor Feeder and optional rotor cutter with variable bale diameters ranging up to 1.5m on the RB 454, and 1.8m on the RB 464. With a 1.2m wide chamber and a 2.3m wide pick up, RB round balers are designed to pick up the widest of windrows for maximum productivity. 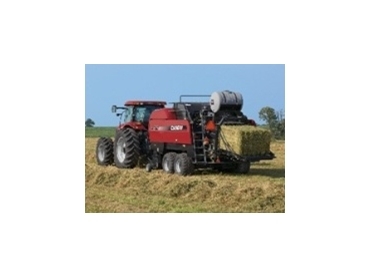 LB large square balers are ideal for commercial growers, custom operators and large scale operations. LB balers provide operators with a choice of bale sizes to match individual shipping, storage and feeding needs. Bale widths are 0.8 m on the LB333, and 1.2 m on the LB433. Bale height on both models is set at 0.9m, and length is adjustable up to 2.7m. In addition, the electronic system of LB large square balers is fully ISO 11783 compliant, which ensures the baler can be attached to any compatible tractor. SB small square balers feature a wide pick-up and heavy duty feeding system to enable the production of high quality 35 x 46 cm bales in a range of conditions. Serviceability and access to key maintenance points are a standout feature, with a new plunger and feeder shielding design.